The Novotel Bangkok on Siam Square is a trendy and modern city retreat catering to a sophisticated clientele. 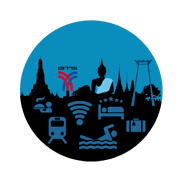 Guests at this luxury 4 star hotel can easily walk to public transport with Siam BTS skytrain moments away, the best shopping opportunities at both street markets and malls at Siam Square as well as great evening entertainment. In-house facilities include a relaxing pool, no less than 5 bars to spend memorable evenings and a choice of 3 restaurants. A fitness Centre, sauna and function venues make up some of the other facilities. With a definitive chic and stylish design room interiors offer some of most fashionable accommodation in Bangkok and as well as ultimate convenience with a range of first class facilities like international TV channels, mini bars and luxury bathrooms. This Novotel hotel is certainly also the number one family friendly 4 star destination with a play area for our younger guests, their own special restaurant menu and assortment of family orientated activities.